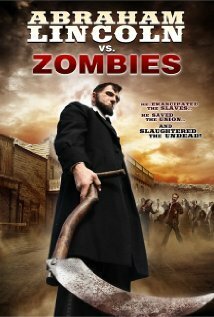 Abraham Lincoln vs Zombies (not to be confused with the theatrically released Abraham Lincoln Vampire Killer) was exactly what I thought it would be: A silly throw away horror/fantasy/alternate history piece of schlock. The movie starts with Abraham as a boy, fighting some zombies with his father, who succumbs to the Zombie menace, leaving young Abraham to destroy those Zombies. Cut to later day, the President, Abraham Lincoln discussing his need to address the troops and the nation at the location of the battle of Gettysburg (you know, “Four score and seven years ago…”), when he gets word that the Zombies he experienced as a boy have risen again. Knowing this menace from personal experience, Lincoln gathers a group of men together to go and capture a Confederate fort at the middle of the infection in an attempt to destroy those infected before the disease manages to spread to the rest of the already divided nation. Of course, Lincoln himself, the Commander in Chief, must lead that small group himself. That group includes John Wilkes Booth, Lincoln’s future assasin. Along the waythey run into Sonewall Jackson and a young Teddy Roosevelt. This silly piece of movie is not great in any way… But actually managed to be better than I expected. It’s not the worse thing I’ve seen by a long shot. If you are looking for a completely silly (but not funny) movie, then this might be for you. I watched it on Netflix, so I didn’t pay much for it – and that is a good thing. I’ve also seen this disc at Wal-Mart in the cheap bins so it’s not hard to find, if you find it necessary to watch. Check out the trailer to see if it appeals to you. This entry was posted on August 7, 2012 by catfishman. It was filed under Uncategorized and was tagged with Abraham, cheezy, civil war, confederates, dumb, epidemic, funny, horror, Jackson, John Wilkes Boot, Lincoln, movie, outbreak, protitutes, roosevelt, silly, Stonewall, zombies.